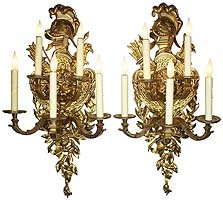 A Fine Pair of French 19th/20th Century Régence Style Gilt-Bronze Five-Light Figural Wall Lights, After a model by Pierre-François Feuchère, each wall light with a plumed helmet and centered by a Medusa mask shield with military trophies issuing two acanthus cast candle-arms above, three further scrolled acanthus cast candle-arms with a ribbon-tied berries laurel spray. Circa: Paris, 1900. These beautifully cast and chased wall lights were most likely inspired by the wall lights by Pierre-François Feuchère, the renown 18th century bronzier, another example but with a lyre back and ribbon-tied berried laurel leaves is illustrated by H. Ottomeyer/P. Pröschel, Vergoldete Bronzen,, Vol. I, Munich, 1986, p. 292, fig. 4.16.16. Pierre-François Feuchère, with his son Lucien-François, ran one of the largest workshops for the production of luxurious gilt bronze work during the late 1700s and early 1800s, but little is known about him. In the 1770's his gilt bronze clock cases, wall lights, and candelabra were in high demand. The firm continued to produce high-quality works into the 1800s under Feuchère's grandson. Henry Dasson (1825-1896) established his workshop at 106, Rue Vielle du Temple, and was an important furniture maker using the very finest gilt-bronze mounts with high quality mecurial gilding. He worked in association with Godot. In 1871, he bought the workshop and stock for 14,000 francs from the widow of the ébéniste Charles-Guillaume Winckelsen, and soon became recognized as a brilliant ébéniste and bronzier. He specialised in copies of Louis XV, XVI and pieces of his own modified 18th century design. Specializing primarily in the production of works from the Garde Meuble National, he participated in the 1878 Paris Exposition Universelle. He was made a Chevalier de la Légion d'honneur in 1883 and was awarded the Grand Prix Artistique at the 1889 Paris Exposition Universelle. When the business finally closed in 1894, an auction was organized clearing the remainder of his stock. Note: A similar but larger pair of these style wall lights by Henry Dasson, circa 1887 were sold at Sotheby's London "Arts of Europe Sale" on December 4, 2012, Lot 514. On a side note: Versace, the Italian luxury fashion company and trade name founded by Gianni Versace, uses of head of Medusa as their company logo. 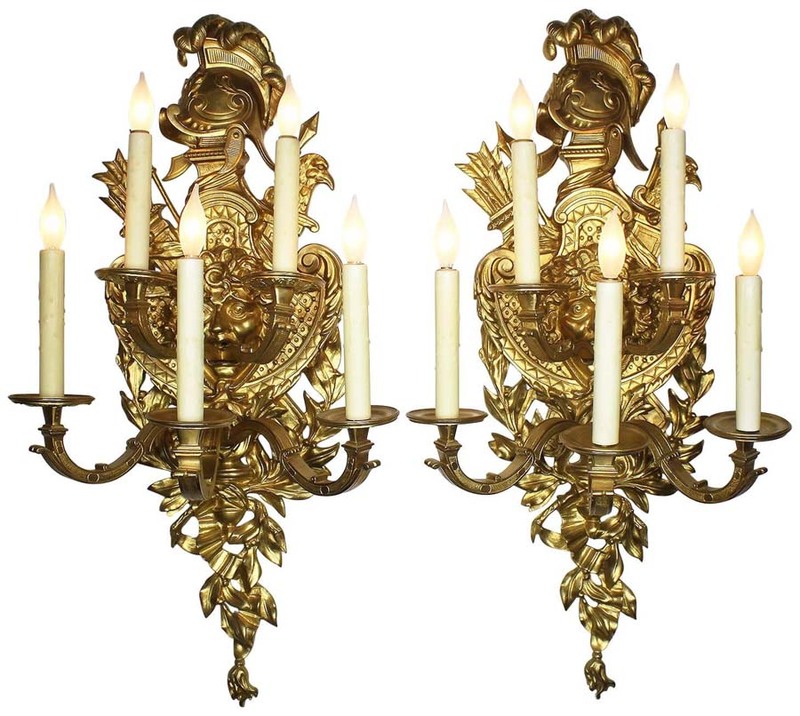 A Fine Pair of French 19th/20th Century Régence Style Gilt-Bronze Five-Light Figural Wall Lights, After a model by Pierre-François Feuchère, each wall light with a plumed helmet and centered by a Medusa mask shield with military trophies issuing two acanthus cast candle-arms above, three further scrolled acanthus cast candle-arms with a ribbon-tied berries laurel spray. Circa: Paris, 1900. These beautifully cast and chased wall lights were most likely inspired by the wall lights by Pierre-François Feuchère, the renown 18th century bronzier, another example but with a lyre back and ribbon-tied berried laurel leaves is illustrated by H. Ottomeyer/P. Pröschel, Vergoldete Bronzen,, Vol. I, Munich, 1986, p. 292, fig. 4.16.16. Pierre-François Feuchère, with his son Lucien-François, ran one of the largest workshops for the production of luxurious gilt bronze work during the late 1700s and early 1800s, but little is known about him. In the 1770's his gilt bronze clock cases, wall lights, and candelabra were in high demand. The firm continued to produce high-quality works into the 1800s under Feuchère's grandson. Henry Dasson (1825-1896) established his workshop at 106, Rue Vielle du Temple, and was an important furniture maker using the very finest gilt-bronze mounts with high quality mecurial gilding. He worked in association with Godot. In 1871, he bought the workshop and stock for 14,000 francs from the widow of the ébéniste Charles-Guillaume Winckelsen, and soon became recognized as a brilliant ébéniste and bronzier. He specialised in copies of Louis XV, XVI and pieces of his own modified 18th century design. Specializing primarily in the production of works from the Garde Meuble National, he participated in the 1878 Paris Exposition Universelle. He was made a Chevalier de la Légion d'honneur in 1883 and was awarded the Grand Prix Artistique at the 1889 Paris Exposition Universelle. When the business finally closed in 1894, an auction was organized clearing the remainder of his stock. On a side note: Versace, the Italian luxury fashion company and trade name founded by Gianni Versace, uses of head of Medusa as their company logo.